well for hoisting drums or other cylindrical objects where a sling must tighten itself under strain and lift by friction against the sides of the object. 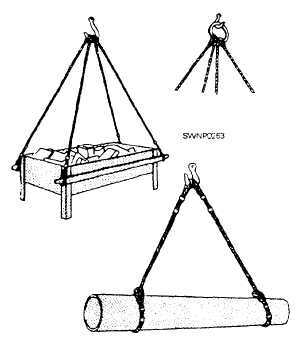 Single-leg slings can be used to make various types of BRIDLES. Three common uses of bridles are shown in figure 6-16. Either two or more single slings may be used for a given combination. The bridle hitch provides excellent load stability when the load is distributed equally among each sling leg, the load hook is directly over the center of gravity of the load, and the load is raised level. The use of bridle slings requires that the sling angles be carefully determined to ensure that the individual legs are not overloaded. NOTE: It is wrong to conclude that a three- or four-leg bridle will safely lift a load equal to the safe load on one leg multiplied by the number of legs. This is because there is no way of knowing that each leg is carrying its share of the load. With a four-legged bride sling lifting a rigid load, it is possible for two of the legs to support practically the full load while the other two legs only balance it. COM- SECOND/COMTHIRDNCB strongly recommend that the rated capacity for two-leg bridle slings listed in the COMSECOND/COMTHIRDNCBINST 11200.11 be used also as the safe working load for three- or four-leg bridle hitches. Figure 6-16. - Multi-legged bridle stings. To avoid confusion and to eliminate doubt, you must not downgrade slings to a lower rated capacity. A sling must be removed from service if it cannot safely lift the load capacity for which it is rated. Slings and hooks removed from service must be destroyed by cutting before disposal. This ensures inadvertent use by another unit. When a leg on a multi-legged bridle sling is unsafe, you only have to destroy the damaged or unsafe leg(s). Units that have the capability may fabricate replacement legs in the field, provided the wire rope replacement is in compliance with specifications. The NCF has a hydraulic swaging and splicing kit in the battalion Table of Allowance (TOA). The kit, 80092, contains the tools and equipment necessary to fabricate 3/8- through S/S-inch sizes of wire rope slings. Before use, all fabricated slings must be proof-tested as outlined in the COMSECOND/COMTHIRDNCBINST 11200.11.